I love cookbooks and have hundreds of them in my home. New releases, trendy editions, vintage copies, dog-eared classics. You name it, I pretty much have it in my disorganized and tattered but beloved collection. Over the years while writing for newspapers, Amazon’s Al Dente blog and my own website, I have reviewed numerous cookbooks and one of my benchmarks for judging a book is whether the recipes and tips really work. Lately, I’ve noticed that many cookbook reviews give a casual broad mention of the content and the author and it’s pretty clear that the reviewer didn’t really crack the book and put it to the test. I often ask myself, did this person peruse it or use it? For me, the true test takes place on the stove and at the kitchen counter. Are the instructions logical and is the ingredient list accurate? Does the author erroneously assume knowledge and omit details that might impact the finished results? Do the recipes add value to the everyday repertoire? Is the content unique enough that the reader is encouraged to ditch tradition, take a risk and try something new? Well, when I recently saw Nourishing Broth at the Amazon Bookstore down at Seattle’s University Village, I put it on my cookbook bucket list and bought it a few days later. Admittedly, the paperback book isn’t flashy.but the contents are indeed explosive. Written by Sally Fallon Morell of the Weston A. Price Foundation, the book covers all aspects of making nutritious restorative homemade broths and is based on in depth research, countless studies, and no nonsense home based culinary tradition. Sally cites research and writes convincingly how a well crafted broth can help tackle issues such as osteoarthritis, rheumatoid arthritis, digestive diseases, mental health, athletic challenges, and even saggy middle aged skin and the dreaded cellulite! This is a lot of the stuff that our grandmothers knew intuitively but somehow got shoved aside as time marched on and the food scene became more dynamic. Consisting of three main parts: Basic Broth Science, The Healing Power of Broth, and Recipes, Nourishing Broth sent me on a little quest. I’ve always made homemade broths for my family and my kids often swear by how my chicken broth, when laced with ginger, garlic and cilantro, can quickly turn around a nasty cold. Sally’s book, however, inspired me to tweak my tradition even further. With my list in hand at my neighborhood Asian market, I headed for the meat department and purchased unique stubby cuts of beef with bones and collagen. On page 168 in the introduction to her recipe for Classic Beef Stock she says: “Good beef stock requires several sorts of bones: knuckle bones…marrow bones….meaty ribs…and shanks…” I gathered a motley but beautiful collection of shanks, rib cubes, oxtail and more. Following her basic recipe and using my big All-Clad slow cooker, I was flabbergasted by the depth of flavor, silky texture and overall richness of the beef broth I created. I incorporated that broth into numerous soups and dishes that week and the feedback was very positive. I really knew I was on to something when I spontaneously worked the last of that broth and beef into a late night beef taco for my 14 year old son.He declared it the “best ever.” My beloved Golden Retriever even took note and sat patiently next too me while I drained the broth at the end of the day! When I half jokingly asked her if she liked “gravy” she licked her lips, wagged her tail and sat at attention! Since then, I’ve made chicken and shellfish broth recipes from the book and incorporated many of Sally’s healthy tips. Priced at $23, this book offers tremendous value and endless healthy inspiration. I highly recommend it. How to Judge a Cookbook? Use It!! 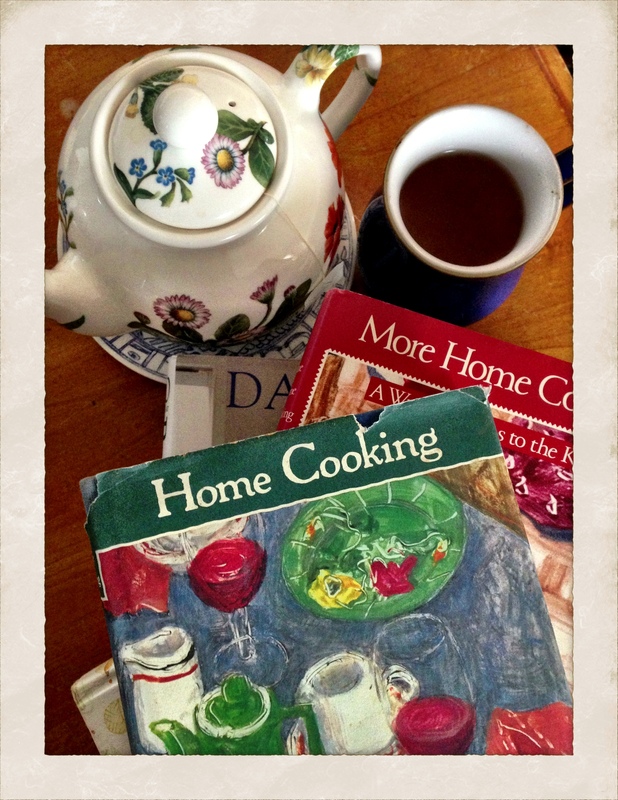 Two cookbook classics…Home Cooking and More Home Cooking by Laurie Colwin. Cookbook reviews can be a funny thing. Even if you aren’t a professional food writer, how do you judge a cookbook? By the cover? By the photos? Or, by the recipe? I have lots of cookbooks in my collection. Many are new. Others are tried and true favorites that were published thirty years ago. Without a doubt, I think the best way to judge a cookbook is to COOK from it firsthand. This was my philosophy when I was charged with the task of writing a cookbook review for The Wall Street Journal many years ago. When I started the process, it was a no brainer that I would have to get the books and then cook from them in order to judge them. No one told me this, I just knew it intuitively. This seemingly sensible approach has guided me ever since. Let’s be realistic, here. How can someone judge a cookbook simply by flipping the pages and spouting their opinions? I suppose they can, but does that review provide a real public service to trusting cooks? I don’t think so. So, like I said, how do you judge a cookbook? By the photos? The writing? The fancy byline? Or by the success of the recipe? ?